Peeps, we have an important announcement regarding the cost of our beloved Kona Cotton, the original fabric from Spoonflower's launch back in 2008. We've always charged $18 per yard for Kona (for Marketplace purchases), but are finally at a place where we need to raise our prices slightly for this lovely fabric. On Wednesday, October 15, 2014, the price of Kona Cotton will increase from $18 to $19 per yard in the Marketplace. If you are ordering from your Design Library, rather than from the Marketplace, the designer discount price for a yard of Kona will go from $16.20 to $17.10. The price change is being driven by an increase in the cost of this fabric to Spoonflower. 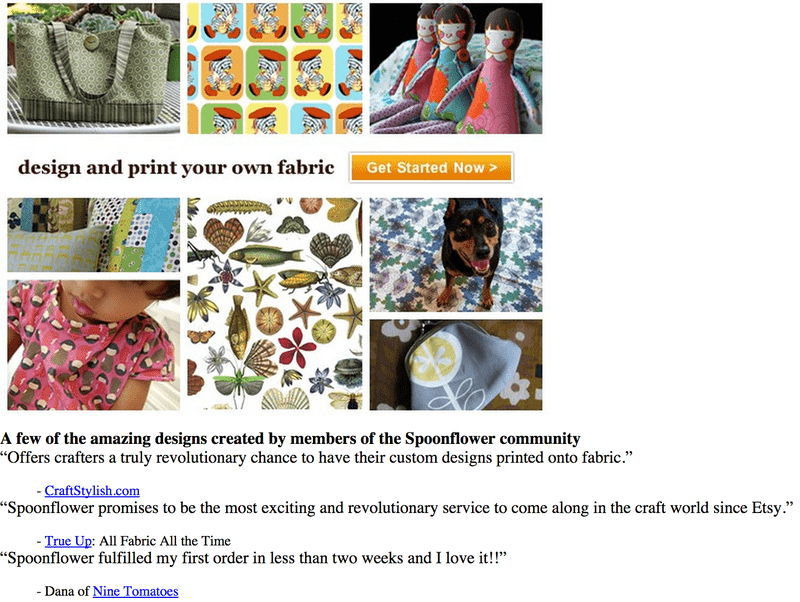 And enjoy a blast from the past: the Spoonflower homepage as it looked going into our first holiday season back in 2008.